At Nodland Cellars, the wine making process is traditional as well with every step of the process being done by hand. Nodland Cellars views wine as liquid art and create the blend of these grapes like music, where each individual variety must play off the other with producing a finished composition you can taste. This comes as no surprise as owners and wine makers Tim and Tracy Nodland began making wine in 1999 as artists. Tracy paints with oils and Tim is a jazz musician . Tim can't paint and Tracy can't sing a note but wine making was art where they could produce together. After awards and recognition for their combined masterpieces, the Nodland's took the step to share their collaboration in 2005 by going commercial. The Nodland winery is more like an artist's studio where grapes are turned into drinkable art and the editions are very limited. The Tasting Room is open Saturdays 12-4pm until sold out. For other tasting times please call. Most European Wineries produce just one red and one white. 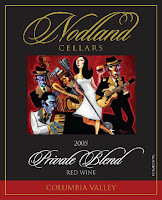 Nodland Cellars follows that tradition by featuring just one red, simply entitled the Nodland Cellar's Private Blend and one white, called Bebop. The Private Blend is a unique variety contains large percentages of Cabernet Sauvignon, Merlot and Cabernet Franc and very small amounts of Malbec, Petit Verdot and Carmenere. The fruit comes from prestigious vineyards in Walla Walla, Red Mountain, Yakima and other parts of the Columbia Valley and are gathered all together for this one hit wonder. The Bebop on the other hand is 100% Riesling is a dry but complex Riesling. Bing cherries and dark ripe plums with licorice and dark chocolate and a hint of vanilla. The next layer is white pepper, middle eastern spice, exotic north African fruit. The wine finishes with tobacco, quince, earth, mineral, espresso, more Asian spice, violets and a variety of desirable sub-flavors. Layers and layers of fruit and spice with a long finish. A great compliment to red meat, Irish white cheddar, salmon, lamb, pork or chicken. 401 cases produced. A dry Riesling that is easy to enjoy but complex in flavor. Floral notes with pineapple, orange blossom, peach, pear and green apple among other flavors. The perfect match for Pacific Northwest cuisine, like shellfish, seafood, vegetarian, fresh vegetables, fruits, nuts and gourmet cheeses like Gouda and light cheddars. (As of 7/15/2010 Only three cases left of the Walla Walla Reserve Cabernet $45. About the fantastic label: The artist that created the jazz band label is Tim Rogerson from Florida. He created this work specifically for Nodland Cellars. Not a big fan of their wine, but they are great people!